This Wheelchair Pulling Leash was created out of the need to have a leash that could be used in conjunction with pulling a wheelchair. The lead needed to be sturdy but at the same time it was necessary for the lead to be flexible. So we used a very heavy weight flat bungee material that is used in horse equipment, so you know it is strong for this application. Our original bungee lead was too cumbersome to attach to many wheelchairs but this flat lead with a full loop, not only makes this pulling lead double strong but you, can loop it through nearly any wheelchair. That is why the design of the large looped handle. It has enough stretch to give the dog room for movement while starting to pull the chair. This amount of stretch is perfect as it gives the dog just enough room to go ahead or behind the wheelchair while getting through a doorway. Doorways are the problem when a dog is used to help pull a wheelchair. We train our ADASDF service dogs to go behind the chair and then when the chair gets through the doorway, the person in the chair stops, if necessary hold the chair brake, and then have the dog come up beside the chair. Eventually the dog will know when it comes to a doorway it falls back behind the chair until the handler gets through the door and then speeds up its pace to get back beside the chair. To train a dog to pull a wheelchair with this lead you first need to train the dog to pull the chair on a flat surface so the dog will get a feel for the stretch in the lead and know just how far it has to move to make the chair move with it. We use the word pull and make it sound three different ways while saying it. By saying it slow “puuulll” the dog learns to walk slowly beside the chair, saying it “pull” we use this for normal walking speed. And if we need the dog to move fast beside the chair we say “Pll” quickly. This signals the dog to walk fast. It is not really complicated if you are always consistent in how you use the word. Just a note: It is important to teach the word “STOP” during regular obedience training as you will need this when the dog learns to pull the wheelchair. We recommend attaching this lead to the wheelchair and having a different lead attached to the dog. The Wheelchair Pulling Leash color is black; it has a solid brass bolt snap on one end. The overall length from snap end to folded end is 24”. See product #707586 for the Pulling & Balance Harness that works with this leash. 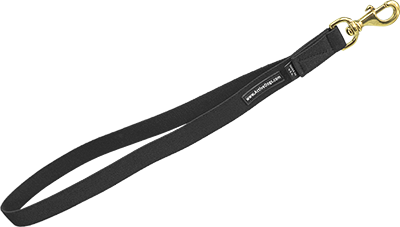 This leash was designed to work directly with our Balance & Pulling Harness (#707586).